The Catholic Commission for Justice & Peace (CCJP) continues to strengthen the structures of the Church. 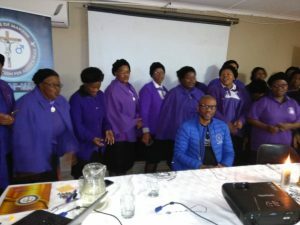 On Saturday, 11th August 2018, the commission had a presentation on conflict prevention, management, resolution and transformation (PMRT), at the Catholic Centre – Manzini Eswatini. This was during the St Anne’s Annual Conference (Our Lady of the Assumption Parish – OLOA). This year’s theme was; St Anne’ as sowers of hope. A total of 37 St. Anne’ group members were reached. Dlamini then defined conflict as energy generated when two or more individuals or groups compete for seemingly incompatible goals in their drive to meet their needs and interests There were four types of conflict that were discussed namely; Intra-personal Conflict, Interpersonal Conflict, Intra-group Conflict, and Intergroup conflict. The use of violence, force coercion, threats and avoiding conflict are some of the negative ways of managing conflict that were discussed. Whilst joint problem – solving is the positive way of resolving conflict. Attendees were encouraged to make peace within themselves before they can actually have peace with other people. At the end of the presentation, a healing process was done and participants wrote down their experiences of pain and others shared what they experienced. This was a vital exercise and participants were relieved after sharing of their stories and advice was given to them from other attendees whilst others were referred for counselling.